Kwik Cycle 9" Die Set is used for AMP Optimate SMA-style fiber optic connectors. 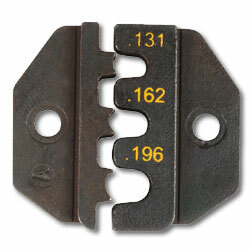 O-style crimp cavities with dimensions of 0.131". It is to be inserted into Kwik Cycle 9" Crimper (45504).